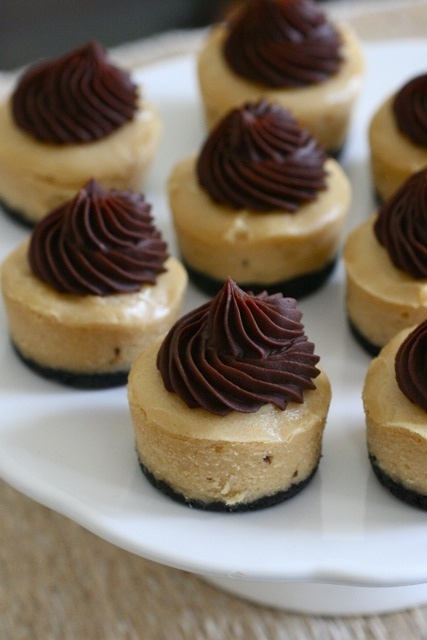 Mini Peanut butter Chocolate cheese cakes..That’s right! I said Mini Peanut butter Chocolate cheese cakes!! This lil gem deserves a post all it’s own! I found it on annies-eats.com. In my own batch I used as many organic ingredients as possible and I used my own healthy cookie crumbs instead of the Oreos. Preheat the oven to 350˚ F. Lightly spray a 24-well mini muffin pan* with cooking spray. To make the crust, combine the chocolate cookie crumbs, melted butter and sugar in a small bowl. Mix with a fork until evenly blended. Divide the crust mixture between the wells of the prepared pan, about 2-3 teaspoons in each. Press the crumb mixture into a flat layer on the bottom of the well. (The bottom of a shot glass or flat utensil is great for this. I used the bottom of my whisk handle.) Bake for 10 minutes. Transfer the pan to a wire rack. Reduce the oven temperature to 300˚ F. To prepare the filling, combine the cream cheese, sour cream and peanut butter in the bowl of an electric mixer. Beat on medium-high speed until smooth and well blended. Add in the sugar and mix until incorporated, about 1 minute more, scraping down the sides of the bowl as needed. Blend in the egg and egg yolk, vanilla and salt. Continue to beat until the mixture is completely smooth. Divide the mixture evenly over the cookie crumb crusts and smooth the tops slightly. Bake just until set, about 22 minutes, rotating the pan halfway through baking. Transfer to a wire rack and let cool to room temperature. Once completely cool, transfer the pan to the refrigerator and chill thoroughly, at least 3 hours. Once the cheesecakes are well chilled, carefully remove them from the pan. To make the ganache, place the chopped chocolate in a medium bowl. In a small saucepan, bring the cream to a simmer over medium heat. Once simmering, remove from the heat and immediately pour over the chocolate. Let stand 1-2 minutes. Whisk in small circular motions until a smooth ganache has formed. Whisk in the butter until completely incorporated. Let the mixture stand at room temperature until slightly thickened for piping onto the cheesecakes. (Speed this process in the refrigerator or freezer, but be sure to whisk every 10 minutes or so.) Once the ganache has thickened, transfer to a pastry bag fitted with a decorative tip and pipe onto the cheesecakes. (I used a large, unlabeled tip to decorate these.) Cover and refrigerate until the ganache is set. *I find silicone mini muffin pans lend themselves to the easiest removal of baked goods, particularly cheesecakes. If you don’t have a silicone pan, you may want to consider using mini cupcake liners for easy removal.